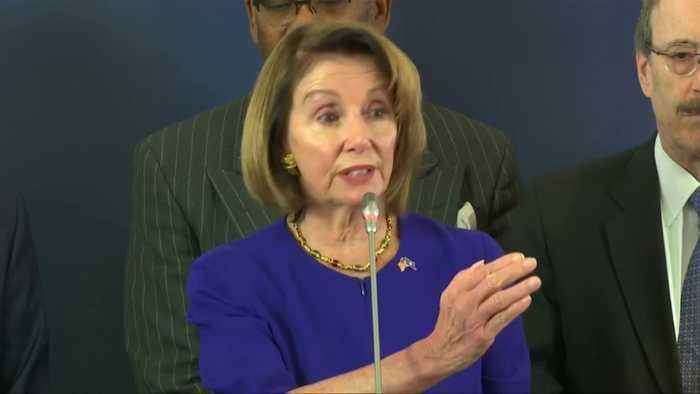 U.S. House Speaker Nancy Pelosi and Congressmen Eliot Engel and Gerry Connolly sought to reassure European allies in Brussels on Tuesday that differences over President Donald Trump's policies were mere "family squabbles" and transatlantic ties remain strong. ROUGH CUT (NO REPORTER NARRATION) U.S. House Speaker Nancy Pelosi and Congressmen Eliot Engel and Gerry Connolly sought to reassure European allies in Brussels on Tuesday that differences over President Donald Trump's policies were mere "family squabbles" and transatlantic ties remain strong. Pelosi cast the visit by a 50-strong delegation to Europe as proof of enduring bonds despite anger in European capitals over what is seen as Trump's disregard for their interests. "It is about one word: it is about respect," Pelosi told reporters, stressing that the delegation was the largest yet to attend the Munich Security conference over the weekend. Misgivings over Washington's leadership on foreign policy issues was on full display at the conference of world leaders, with anxiety mounting over division in the West on how to deal with threats ranging from nuclear arms to climate change. "Like in a family, there are ups and downs," congressman Eliot Engel, chairman of the foreign affairs committee said. "Things sometimes are bumpy, but they straighten out." Refering to unease in transatlantic ties, congressman Gregory Meeks remarked: "We may have a squabble but those squabbles will dissolve." The European Union and the United States have traditionally been the closest of allies, working together also via NATO. Trump, however, has lambasted his European peers for not spending enough on defense, raising doubts among many in Europe about his commitment to the Western military alliance and Europe's broader security.